Not too long ago, while searching Sally's shelves for Hair One moisturizing shampoo, I passed an eye catching Motions display. I noticed that there was something different about the products, the familiar Motions labeling I was used to had changed. They were now advertising their famous product with a brand new ingredient, marula oil. I didn't let the new and improved look of the product packaging distract me from reaching the Hair One, but I did secretly vow to research this oil and learn as much as I could of marula. Numerous product manufacturers are introducing this oil into their product line primarily because of two reasons, marula oil is highly stable (means it won't oxidize quickly) and because of the highly absorbent nature of the oil. Marula oil is not considered an "oily" oil, it's actually described as a "dry" oil. What this means is that if you rub marula into the skin, the oil will skin right in and absorb very quickly. Don't let the word dry fool you, marula is raved for its highly moisturizing effects on the skin. Because of its absorbent, moisturizing quality, you'll find marula is various skin care products including the natural products in your neighborhood Body Shop retailers. I typically tend to buy plant oils in its pure form rather than purchasing hair products with the oil listed as one of the last ingredients. I don't have the patience for unecessary fillers that may only increase the likelihood of build up. 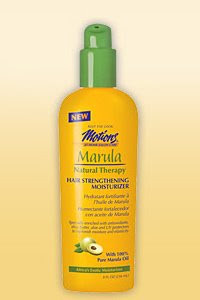 Marula oil is not yet a part of my hair stash but I do see myself purchasing it sometime in the future. The qualities of this oil make it a great option for those of us with dry scalp. Think about how beneficial a moisturizing absorbent oil could be to dry itchy scalp. I also sometimes add a dab of oil to my facial moisturizer to give my skin some extra umph! Marula oil seems like it would be awesome on dry skin without leaving you all shiny and stuff. While looking online, I noticed that most resources detailed the oil's benefit to the skin moreso than how it could benefit the hair. I imagine that marula would also be absorbed by the hair shaft almost as easily as with the skin. As I mentioned before, the qualities of the oil seem to be a godsend to dry scalp sufferers. I'm thinking the oil would work well in treatments where we include heat, such as the deep conditioning, flat-ironing, or rollersetting. My guess is that marula is not a heavy oil and won't weigh down the hair but you never know. Once I am in possession of marula, I'll most certainly update you all on the realities of this oil. For now, I'll just jot it down on my hair product wish list. My mom bought this oil and I love it. It almost felt like a moisturizer and I love the way it just absorbs into my fabulous 4b hair. Love this product, picked it up by chance. I have been transitioning my relaxed hair to natural since December 2011 and I hadn't found a product that kept my hair soft until now with Motion's Marula oil. I suffer from dry scalp and so far so good. The first use sold me and the fragrance is wonderful. In case you still have yet to try it, I started using a pure marula oil I bought on sale right next to Argan oil at Whole Foods. My daughter had an episode of dry scalp and eczema. Her skin is pretty much healed now and for her scalp marula oil alone did the trick, except of course I avoided shampooing it, I just did diluted Burt's bees baby shampoo once every three to four weeks. I tried Argan oil and for some reason her scalp just kept coming out dry with it. I started putting a little marula oil on my own ends where my hair curls the most and it is amazing. Get fabulous touchable legs with Coconut Oil! My ayruvedic oil wash results!